You can find the printable pattern on Ravelry. Row 1. Hdc 96 in tlo of the ch. Ch 2* and turn work. Row 2. Hdc 96 in blo across your row, ch 2 and turn your work. At the end of row 12 ch 2. You are now going to work into the end of the scarf. Row 1. Sc 14 across the bottom of your scarf. Ch 2 turn your work. Row 2. Hdc 14, ch 2 turn your work. Row 3-4. Repeat row 2. Tie off your work and sew in the tail. 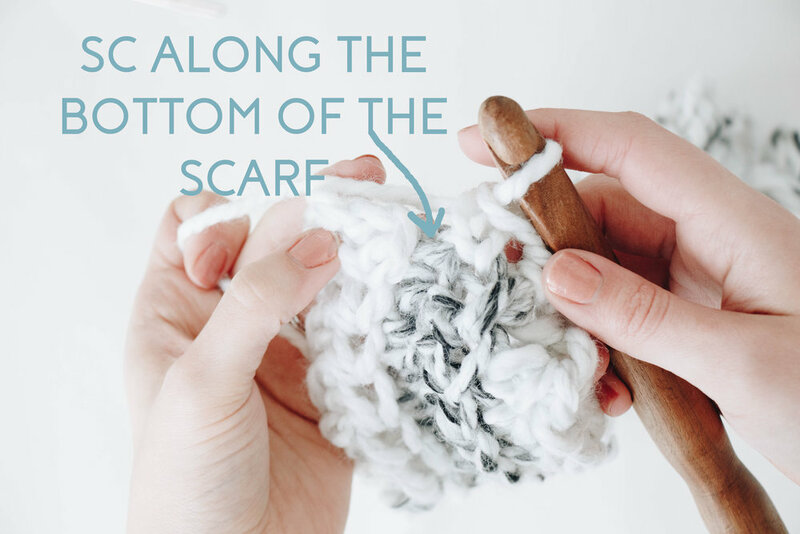 Repeat the steps for scarf ends on the other end of your scarf. You can follow the link below to see a tutorial showing the stitches used in the pattern. - When I ch 2 at the ends of my rows I cinch them down tight. You can also just ch 1 and the end of your rows. I just prefer the look of 2 tightened ch’s. - If you want more length on your scarf you can continue your scarf ends until you reach your desired length. You can also shorten it by only doing the sc st’s across the ends. - Your ch 2 that you do at the end of a row does not count as a st for the row you are turning to work on.